Chis Ferguson has won the 2017 World Series of Poker Europe €1,650 pot-limit Omaha eight-or-better event, defeating a field of 92 entries to win the €39,289 ($45,968 USD) top prize and his sixth career gold bracelet. The 2000 WSOP main event champion is now tied for ninth on the all-time bracelet leaderboard, joining the likes of Daniel Negreanu, TJ Cloutier, Jeff Lisandro, Layne Flack, Ted Forrest and Jay Heimowitz. The 54-year-old poker pro was one of the biggest names in the game during the poker boom. 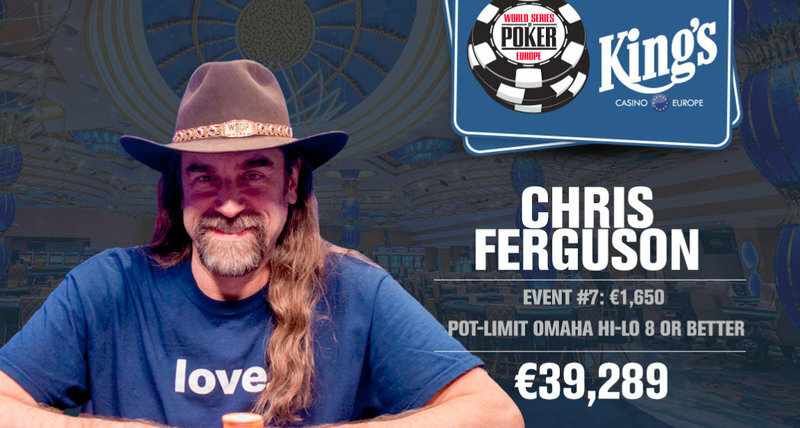 Ferguson’s trademark long hair and goatee earned him the memorable nickname of “Jesus” and his success on the felt helped propel him into stardom. In the wake of poker’s Black Friday, Ferguson, who was a board member of Full Tilt Poker, took a five-year hiatus from the game. When the United States Department of Justice shut down the three largest offshore poker sites on April 15, 2011, FTP was unable to produce roughly $300 million in player funds due to what the government termed a “global Ponzi scheme.” Players were only repaid years later after PokerStars acquired Full Tilt and its assets from the government. Ferguson settled in the government’s civil case against him in 2013. No criminal charges were filed and Ferguson has not publicly discussed the issue since. In 2016 Ferguson made his return to the poker stage and has since found success at the WSOP. Last summer he cashed 17 times at the Rio, and so far in the WSOP Europe at the King’s Casino Rozvadov he has notched another six cashes including this win. Ferguson came into the final day of this event in eighth chip position with 18 players remaining. He didn’t score any knockouts as the field was narrowed to the final table. “It’s kind of surreal because I wasn’t expecting to win this bracelet at all. I was just trying to sneak in, just trying to advance a little bit. And it just kind of happened. It’s the best way,” Ferguson told WSOP reporters after it was all over. Ferguson mostly just survived to short-handed play, at which point he went on a tear. He started by eliminating Rex Clinkscales in fifth place ($9,925 USD) and followed that up by busting both Eldert Soer (4th – $13,681 USD) and Stanislav Wright (3rd – $19,430 USD) to take a sizable chip lead into heads-up play against Ukrainian Stanislav Wright. Wright was unable to overcome the 4:1 chip disadvantage. The two saw a flop of 8 6 4 and got all of the chips in with Ferguson holding the A 10 8 3 against Wright’s A 5 4 2 . The turn brought the 2 and the river the 5 , giving Ferguson the wheel to scoop the pot and the title. Wright earned $28,411 USD as the runner-up.